If you exit Mornington Crescent station between Mondays and Fridays, you will join a procession of hundreds of London's most adventurous dressers. You can follow the trail of paint box–coloured trainers, clashing prints and Insta-bait accessories straight across the road to the ASOS head offices. This month on Who What Wear UK, we are celebrating bold and brave style, so where better to understand this mentality than in an office where this is practically the official dress code? After I spent five minutes waiting in ASOS's reception area, it quickly became apparent that this is an office where people really dress up for work. At 10:30 a.m. on a Thursday morning, I spied Clueless-esque crop tops, leopard-print leggings, rainbow sequins and glittery orange eye shadow passing through the security barriers. I met nine members of the 4200-member team from across different departments and asked them to wear an outfit that represents how they dress for work every day. From zebra prints paired with florals to multicoloured patchwork jeans, these nine outfits all challenge our idea of workwear. Keep scrolling to see how they dress at one of the most stylish offices in London. Felicia works on the magazine team, where she does interviews, features and trend pieces. This dress-and-boots combo is her workwear uniform, as she explains: "I wear flats, firstly—usually Doc Martens—and some kind of midi pleated skirt or midi dress with a defined waist. It's always midi, and usually in black or a dark colour. I also wear blue, but that's more of a football thing because I'm a big Chelsea fan, so I will wear 'Chelsea Blue'. It's really dangerous working here; I have never bought so much in my life. I am very into earrings and jewellery, and with my hair, I can get away with really big earrings, so I always do that. I am more of an accessories person, and am all about buying classic pieces and then tapping into trends with fun accessories." Identical twins Lauren and Dominique don't only share a wardrobe—they also share the exact same job. The twins are both shoot assistants in the model studio, where they create product images for the site. "We shoot about 60 products a day," explains Dominique. "We have about four minutes to shoot each product, and that includes video as well, so it's very fast-paced. We are quite relaxed and casual at work because we have to do a lot of running about, so we wear a lot of trainers, jumpsuits, Converses, sliders and slouchy relaxed clothes." "We share all of our clothes, and it makes it easy. If something looks good on Dom, it will look good on me," says Lauren. "It just means we run out of clothes a lot quicker because we think, I've seen that on her a million times. We both pick out what we like and then Dom tries on everything; she's always been our designated 'try-er on-er.' We mainly base what we buy around our work wardrobe, and if we won't wear it to work, then there's no point buying it." Sara is a designer in the tailoring department, creating the blazers, trousers, skirts, shorts and many of the co-ords you see on ASOS. She also oversees ASOS's Curve Instagram account. "Colour gets me excited," Sara explains. "I love it, and it's part of my job to do the colour research for ASOS—going through shows and finding what colours are coming through for the season and forecasting the next key colours. I have always loved colour, but it's only become more and more important to me. Now I buy everything colourful—if possible—and will only wear black as something to wear with bright colours," she says. For this season, Sara is loving rainbow prints and rich colours like buttermilk and '70s-inspired sage green. Why? Because she thinks they always look expensive. Coco is a junior sportswear stylist, and so as expected, she is a self-confessed "massive sneakerhead." She explains: "I own in the realms of 100 (or close to that) trainers, and I keep them in storage and a lot of compartments in my room. I collect socks too to accompany the trainers. "I wear anything that's loud," says Coco, when asked what she usually wears to work. "Colour is normally my thing. I like to mix textures and fabrics, such as denim and silk. The weather is my nemesis, so I often bring two options to work and do a midday Mariah Carey change. I massively make an effort for work. As a stylist, I'm an ambassador for the brand. Even if I'm not in the building, I still have to look the part. I pride myself on my appearance all the time—from my hair down to my shoes. It always has to be a certain level, and if it's not, then I'm not normally happy. I am stringent at planning everything the night before. I iron and try everything on and I spend an hour every single night on my outfit just for one day. Not for a week—for one day. I do that religiously no matter what time I get in." Lotte is one of ASOS's Insiders and is on the social media team, working on the brand's Facebook, Instagram and Snapchat accounts. "Ever since becoming an Insider I really have to think about what I'm wearing every single day in case I need a photo," Lotte says of what she wears to work. "I'm a big fan of a dress and am normally in a midi floral dress like this one. I like a key piece that I can chuck on and wear with trainers or dress up if I feel like it. My Nike Air Forces are my staple everyday shoes." On Ele Pucci: ASOS White Suede Kitten Heels (£60); ASOS Design T-Shirt in Boxy Fit With Florida Orange Print (£20); ASOS Design Recycled Florence Authentic Straight-Leg Jeans in Chayne Green Cast With Rips (£25); Orange check jacket made by Ele; Small Pointy Cat-Eye Sunglasses (£12). Ele is a 12-month intern working in the pattern room, seeing how the designers' works are brought to life. This is her typical work look, as she explains: "I wear a lot of slogan T-shirts, jeans and shoes with a mini heel. Part of being in the pattern room is that they encourage you to make your own things, and as tailoring is the hardest to get right, I made this jacket as part of my internship. My favourite thing I've worked on is sequinned wide-leg flares." 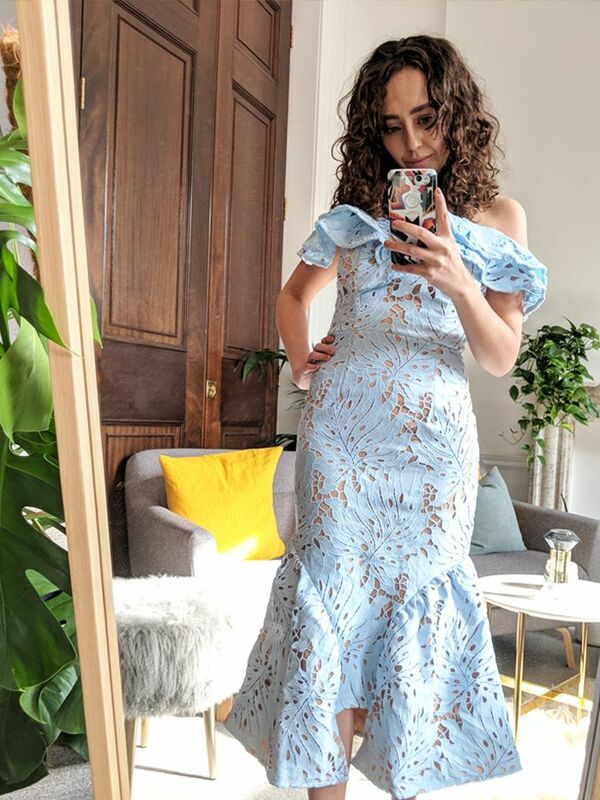 Similarly, a love of colour is something that many of the ASOS staff have in common, as Ele says: "I wear a lot of colour, and so will always, always have on something bright—especially in the summer. I've also got loads of stripey T-shirts, so those are my staples." Michelle is ASOS's video producer, working on everything from campaign videos to Instagram videos. But she hasn't caught the colour bug that is going around ASOS, as she wears almost exclusively black. "I have just redecorated my house, so I have just put all my go-tos on a rail. Everything is black and grey, and there's maybe a white shirt. I don't like to stand out so much, so I feel best in black with a tiny touch of colour." As for her work wardrobe, she adds, "I am always running up and down on set, so need to be comfortable. I usually wear Converse or Vans, jeans and a T-shirt. Sometimes I wear a shirt to dress up." Holly is the Face and Body PR manager, so it's the beauty section that she spends the most of her time on. 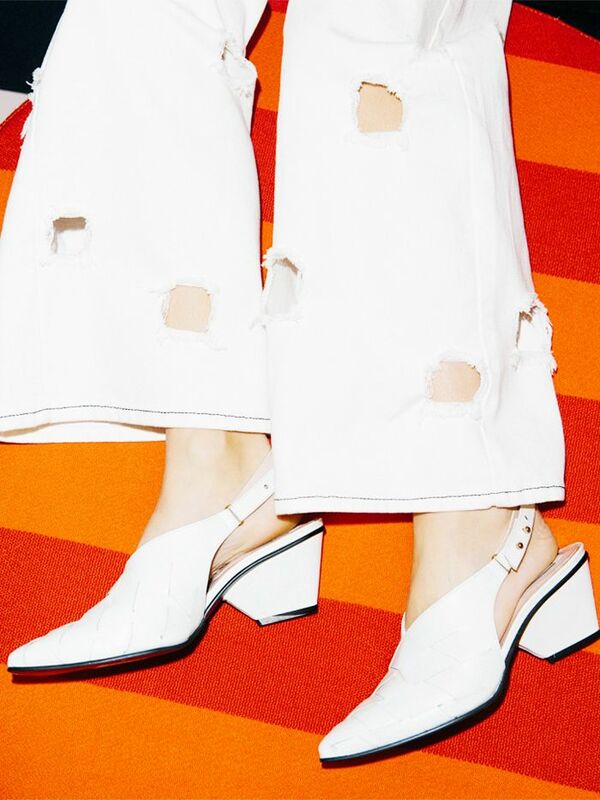 "Normally, I wear a pair of jeans, Stan Smiths and a black T-shirt—unless I have a meeting, in which I'd wear something similar to what I'm wearing today: an ASOS White dress, some chunky, fun heels and lipstick. I like makeup to be an accent—whether it's a blue eye shadow or an orange lip. I will always have with me the ASOS Bossy Mascara (£8), some kind of foundation from MAC or Nars and always a Laguna Bronze bronzer." To get a look at another stylish London office, see what the Browns team wears to work.